January is #NationalOatmealMonth and also #NationalSlowCookingMonth, so when I chose my recipe for this month's Fantastical Food Fight, I looked for something that was both. The call out was for overnight oats, and while I'm a big fan of the version done in the fridge, the slow cooker versions are pretty great too! This Cherry Almond Overnight Oatmeal from Geraldine S. was perfect. I didn't make any changes to the recipe this time around. I'm partial to the Flahavan's brand of steel cut oats, and I used unsweetened vanilla almond milk. Dried cherries were great, it would also be good with dried blueberries or cranberries too! I have a 6qt slow cooker and I used the 10 hour setting to make sure that they wouldn't overcook. You could also double the recipe, but my guys are tree nut allergic so I'll be the only one eating this. I packed the leftovers into jars, I'll just add a splash more almond milk to it and reheat them throughout the week. Thanks so much to Sarah for hosting this Overnight Oats #FantasticalFoodFight! Be sure to go and check out what everyone made using the links below. Do you want to join in the fun? Check out how here: http://www.fantasticalsharing.com/p/fantastical-food-fight.html. Cherry and Almond are one of my favorite flavor profiles. Using a slow cooker is such a great way to prepare these, isn't it? 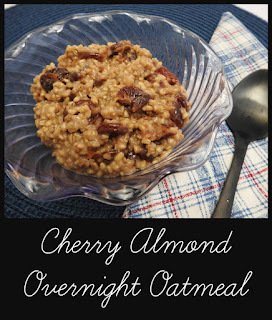 I love slow cooker steel oat recipes and cherry and almond together is perfect!